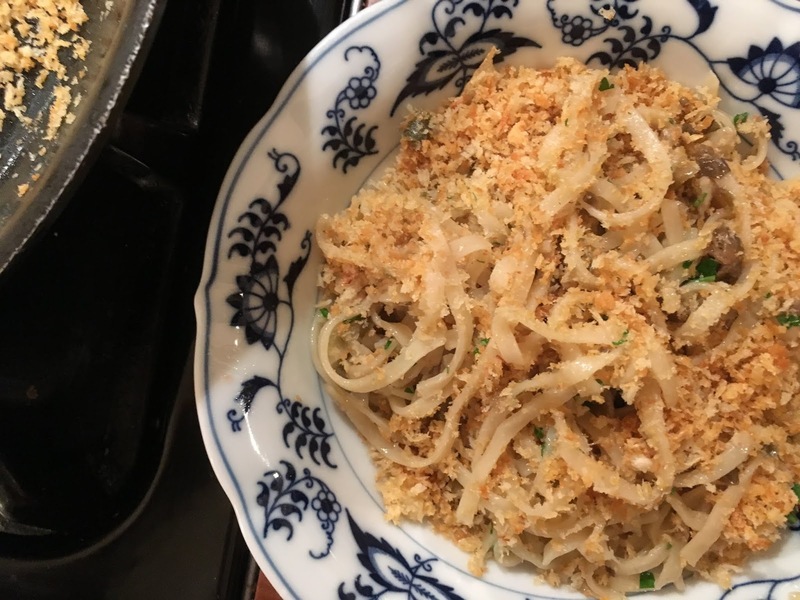 This pasta dish is reason enough to always have capers, anchovies, garlic, breadcrumbs, and pasta in the pantry at all times. While your bringing your pasta water to boil, sauté three sliced garlic cloves in a heavy pour of extra virgin olive oil over medium heat in a large sauté pan. Brown the garlic on both sides then discard. Turn down the heat to low and add a cup of breadcrumbs or panko to the pan. Toss occasionally for a few minutes with a spatula until it’s thoroughly toasted, then set aside. Add some more oil to the pan along with some capers, a drained can of anchovy fillets, and a pinch of red chili flakes. As it heats, break up the anchovies with a wooden spoon. Before draining your pasta reserve a cup of the water from the pot. Once drained, toss the pasta in the pan with the anchovies and capers, some grated parmesan, chopped parsley, and the reserved pasta water as needed. Plate and top with the garlic breadcrumbs.